I have actually had this little table for over a year. I got it for a song at a local thrift shop. I loved the hairpin legs, even though they were brass or gold tone. First, I flipped the table over and spray painted the legs with Rustoleum Chalked Paint in Charcoal. ( I really like this spray paint) I applied three coats. Then I sealed the legs with Krylon Satin Spray Sealer. 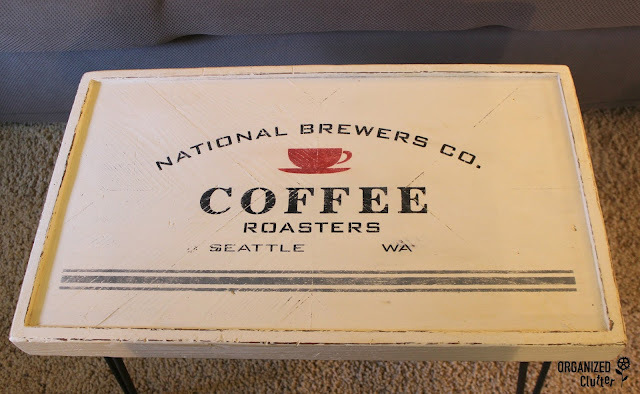 I used a great coffee stencil from Funky Junk Interiors/Old Sign Stencils. The grain sack stencil is also an Old Sign Stencils product. Before stenciling, I gave the table top two coats of Annie Sloan Chalk Paint in Old White. After distressing the edges and lightly in the center of the table with 220 and 100 git sandpaper, I stenciled on the coffee design. The cup is red, the lettering is black, and the grain sack stripe is gray. I brushed on two coats of Varathane matte poly to protect and seal the wood. 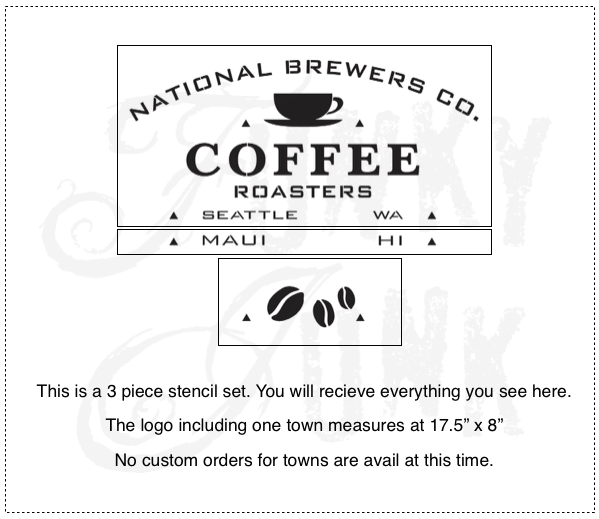 If you have never stenciled, you can refer to the detailed tutorial here *at Old Sign Stencils. My biggest tip is use a pretty dry stencil brush. If it's too wet, you will get bleeding around the stencil. 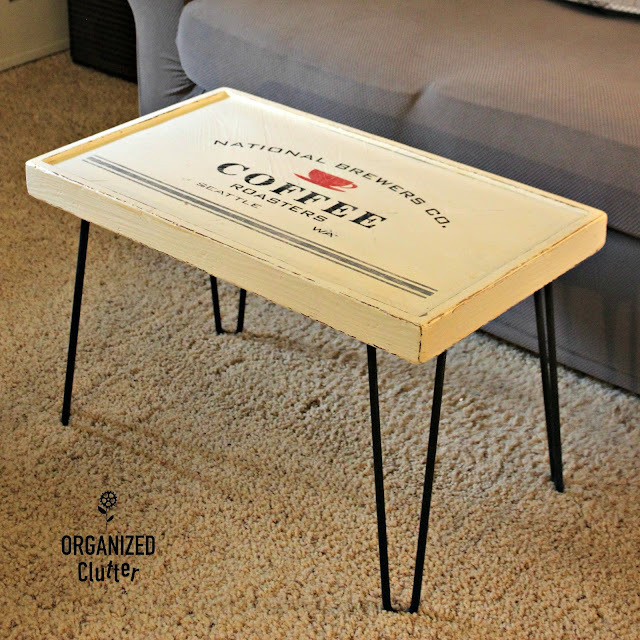 Besides the great stencil, the hairpin legs make this little "coffee" table adorable! I guess I thought the stencil should be readable from the sofa. Or should I have the stencil facing out? Another project completed for my room makeover! 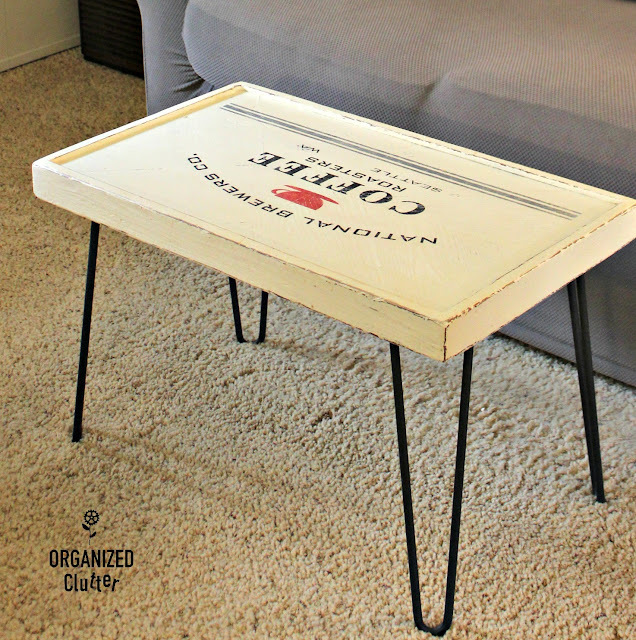 Carlene, this is the sweetest coffee table I ever did see! Thank you for making this stencil shine the way you do! Now to find some of those cool pin legs! 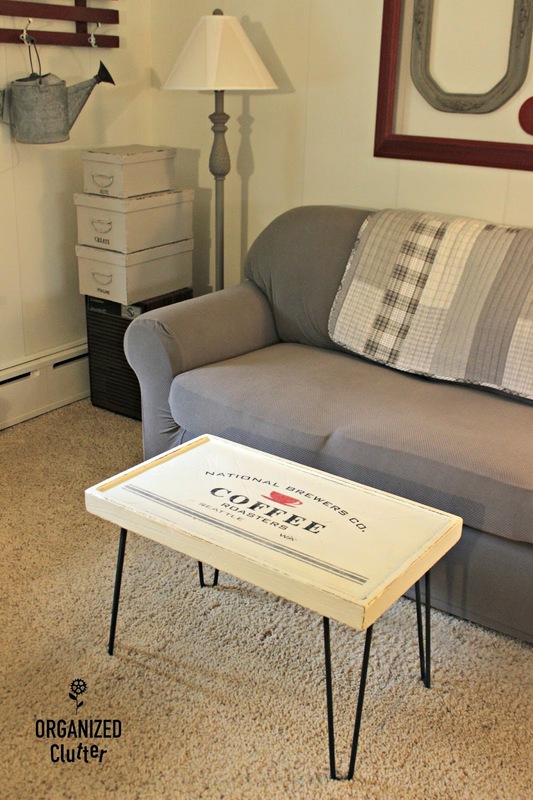 Such a great looking table, Carlene...the stencil is wonderful and I love the hairpin legs! 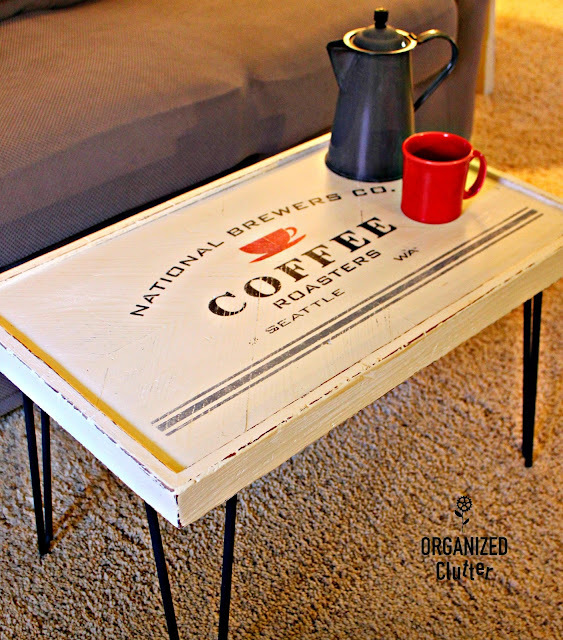 Pinned that great little coffee table. Love Donna's stencils. The grain stripe was just the right touch. Wow, I love how it turned out! I completely love this! I'm a huge coffee fan, the drink and the design. So cute! Adorable! I'm always wondering that too-lettering in or out?